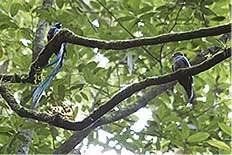 Los Andes forms part of one of the first cloud forests dedicated to the protection of the Resplendent Quetzal, an initiative started by Dr. Anne LaBastille back in 1968, when she first visited Los Andes and worked on a Quetzal research project. The result of this was an article published in the January 1969 edition of National Geographic. 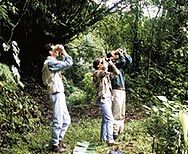 She also created, in 1972, the first Association in Guatemala dedicated to the conservation of this magnificent bird, making Los Andes the first protected area officially declared in Guatemala for the protection of the Quetzal , an initiative that still continues today. 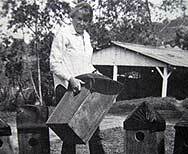 Artificial nest boxes were designed by author to try to reduce mortality of nesting quetzals, whose nest trees and stumps often fall down. 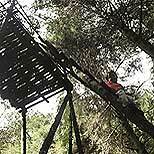 The boxes were placed in cloud forest in safe locations and eventually accepted and used by a few birds. 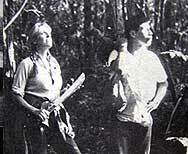 From Anne LaBastille’s book “Assignment: Wildlife”, Chapter 8, “A Quetzal Reserve”.